Recycling is considered as best low investment business in present time. Recycling is also a type of business opportunities that involves making use of green and eco- friendly methods and trends. With more number of people getting eco conscious, this business is expected to flourish in near future. So this is also considered as bent opportunity for new entrepreneurs at start ups. Recycling is all about manufacturing new products from already used and disposed products. You just have to procure used waste and process it for manufacturing new products that can be used again. You can resell the new product back to old sellers or new buyers in the market. The business is still in its initial implementation phase so has a lot of prospectus for new venture. Recycling business focuses on collecting and processing wide variety of used products including cans, plastic products, cell phones, batteries, electronic boards, glass, house hold goods, industry waste and chemicals, computers and much more. The list can simply be endless. Some of the top rated recycling business opportunities are listed here below. Used Aluminum soda cans recycling business is very much profitable. You may not have to invest heavy capital and at the same time you can expect to generate better profit margins. Soda cans are also available free in most refreshment centers. So if you are aware of the nearby market, then this can be ideal choice for you. You can reach the people by advertising in your locality. You can also directly contact the manufacturing companies directly for selling used cans. This is a type of gold mining business where you can process old and scrap gold for remaking new pieces after processing. The cost for process is much lower as compared to mining new gold. The price you earn will be equivalent to its purity. This Business plan is also ideal as low investment business plan. If you are running short on capital this is best option for you. You just need to advertise within your locality for collection of cans, paper and plastic garbage. You can sell these for higher price. There may be hundreds of construction sites within your locality and you can visit them and collect their waste. This can include electrical materials, left over steel and iron rods, hardwood, left over cement and other construction materials. These materials can be sorted out and sold individually to bigger recycling units. Garbage recycling business is considered as one of the most profitable recycling business. You will just have to invest money in hiring collection services. Try and collect recycled garbage on regular basis. You can also provide house holds with different types of bins for collectables. Recycling used printer and copier cartridge is also considered as very much profitable. To get started you can also collect goods from commercial and residential complexes. Most people dispose used printer and copier cartridges very often that can be bought and sold back for much higher price. Waste from household electronics are also ideal recycling products. You can purchase scraped goods for free or lower price. You can also look around for recyclers who are interested in purchasing electronic devices for better price. You can collect old used mobile phones, computers, TV sets and other electronic devices. One of the most profitable recycling business ventures is to remake used house hold items like furniture, upholstery, kitchen items etc. these will always fetch you better money in the market once they have been remade. You can also sell these items as art effects and decorative pieces. There are thousands of people who replace old vehicle tires after use. These tires can be purchased for lower price and resoled back to new again. The reused tires can offer with much higher price as compared to worn out tires. The business in the initial stage may require you to invest some money in purchasing raw materials, rubber soles and heating machines. You can ensure that the money can be recovered much earlier in time. Apart from this you can also find used and worn out tires lying around freely around highways and road sides. These can be bought for free from any where. There are a number of copper alloy products that are simply thrown away by users. These are also considered as one of the most valuable pieces of recycled goods. You can collect used bronze pipe, cooking pots, fixtures, transformers, circuit boards, copper wires etc. you may not even have to invest much capital in this business in the initial stage as most items are available free as dumped goods. In present time, steel is also considered as one of the most recycled product. Most alloys and metal products are manufactured using steel as alloy. You can recycle used steel from construction metals, sheet metal, used blades, cast iron etc. Processed steel can be used as raw materials in industrial manufacturing units. In present time more number of people are used to making use of computers and other such devices. One of the benefits of computer is that it has a number of used parts that can be recycled and used back in new computers. You can recover CD write units, mother boards, IC, fan, RAM cards etc and sell it back in bulk to new computer manufacturers. You can collect plastic items from house holds and commercial premises. These can be sorted out as per the grades and then recycled. Plastic is also one of the highest valued recycled product. There is high demand for recycled plastic in the consumer market as most furniture, kitchen products, machine parts are manufactured using plastic as base raw material. Apart from this you can also recycle used car batteries and old mobile batteries. Used car batteries can easily be recycled by replacing electrodes and sold back for much higher price to auto dealers and private car owners. Junk automobiles can also be recycled if you are willing to invest some money in the initial stage in the business as capital. Apart from this wood recycling business is also gaining popularity presently. These are also easy to recycle and do not require much money as investment. 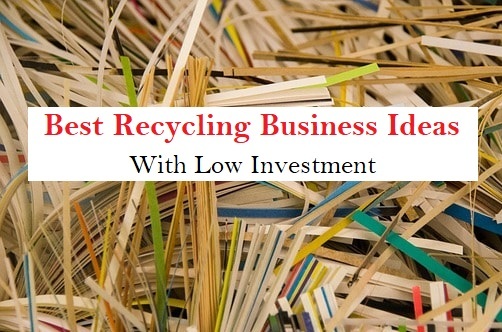 Recycling is a business plan that does not require much investment at startup but will definitely fetch you more money in returns.